Just Romantic Suspense: Author…Where do Characters Come From? Author…Where do Characters Come From? Congratulations to "Mary P." and "Jonetta A. ", the winners in Cindy's giveaway. Thank you to all who participated! It’s giveaway time! I’ll be giving away two ebooks of Into the Crossfire to two lucky people who leave me a lovely comment. Good luck! Well firstly, take a look at the man on the cover of Into the Crossfire. I know very few—wait, let me rephrase that—I know absolutely NO ONE who looks like that or my character, Jack Haliday. My older brother has made claims on FB several times that it is a photo of him—wishful thinking on his part—Big time! That said I do know who the man is, Stuart Reardon—professional British rugby player/model. Now that I’ve cleared that up, where did this hot ex-Navy SEAL character, Jack Haliday, come from? He emerged from the other book series that I write, the Unbridled Series. While I was writing book three of the Unbridled Series, Dangerous Deception, I needed a police officer/detective and so I wrote in the character Jack Haliday, an ex-Navy SEAL who was now an undercover detective. As I wrote the story this character was speaking to me. Suddenly, without intention, the man had a lovely wife who was pregnant, and suddenly I was falling completely in love with this witty brave and oh so very handsome detective. Okay, after the book published I thought very little about him again—until I started writing book four, Against the Ropes, and there he was again bidding for my attention, and winning without much effort! After Against the Ropes published I decided that I wanted to write a black ops series—I love reading them—why not write one? However, I couldn’t resist letting Jack Haliday ride along for one more Unbridled adventure—he made his final appearance in the Unbridled Series in book five, Shady Deals. Some of the characters from the Unbridled Series make an appearance in Into the Crossfire to help usher Jack into his series, First Force—I kinda like that. Thanks guys! If you’re an author reading this you know exactly what I’m talking about. Characters tell us when they want to fall in love and when they want to make love. They tell us how they are feeling and what they fear, and as authors we react accordingly. So where do the characters who whisper into our ear come from? Many places. They come from our childhood, our relationships, experiences, and things we witness—currently or from long ago. Characters are asleep in the deep crevasses of an author’s mind—they awaken and emerge making themselves known to us when the time is right, and then our fingertips race over the keys to make them flesh and bring them to you. 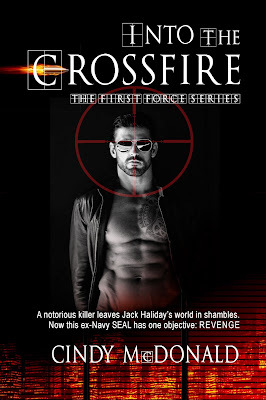 I will be giving away 2 Kindle copies of INTO THE CROSSFIRE to 2 people who leave either a comment or email entry. Giveaway ends 11:59pm EST Sept. 8th. Please supply your email in the post. You may use spaces or full text for security. (ex. jsmith at gmail dot com) If you do not wish to supply your email, or have trouble posting, please email maureen@justromanticsuspense.com with a subject title of JRS GIVEAWAY to be entered in the current giveaway. This sounds like an exciting read. Looking forward to finding out more about Jack Haliday. Oh, heartbreak and high suspense! Sounds delicious. I have to tell you that just reading the blurb for Into The Crossfire gave me goose bumps and had me saying "Oh no" to myself. If reading just that little bit has that effect on me, I absolutely have to read it! this does look exciting!!! Congrats to Cindy on her new release! Thanks for sharing :) Awesome cover!!! Oh wow, this book has my attention! Congrats on the release... this sounds really good! This one sounds just awesome!! This is my kind of book, can't wait to read it. Putting it on the wish list. Wow! What wonderful posts! I truly appreciate all the kind words, and I can't wait to see who wins!